Catch all for topics that don’t fit anywhere else. Nipro, a small sake brewery in Richmond British Columbia, Canada has sadly closed with no details as to what happened or when that I could see. Now, thankfully to Yuki Kobayashi and Yoshihiro Kawamura the old Nipro brewery and its Toji, the brew master Yoshiaki Kasugai has been resurrected as YK3. Starting sometime around November 2013 YK3 will be offering three sakes: A standard Junmai, an all koji Junmai and a nigori style sake. Elise Gee documents the interesting details of the transition from Nipro to YK3 in her post: Giving Nipro brewery new life as YK3 Sake Producer. Cedar River Brewing Company (CRBC) is Seattle’s own Sake kura with Jeff James as brew master. CRBC has just recently started shipping their sake to a few restaurants and bottle shops. Initial shipments to restaurants were exclusively in 3 gallon buckets; pretty nice. CRBC’s Junmai release party was held at the brewery and at Sake Nomi in December 2013. Blue Kudzu is a small sake brewery that will most likely begin offering their sake in early 2014. However, Blue Kudzu is more than a sake brewery; it is also a restaurant with a large sake menu and a mission to teach others about sake. Blue Kudzu is located in Asheville, North Carolina. Ben’s American Sake will live at Ben’s Tune up, an Asheville, North Carolina restaurant that is also planning to offer their own sake in early 2014. Jonathan Robinson will serve as Toji. Blue Current is a micro-brewery in Maine. Dan Ford and John Sygowski own and run Blue Current. I don’t believe they are shipping sake yet but I have requested and update to provide more accurate information here. That is currently all of the new kura that I know of. Did I miss any that you know about? Author WillPosted on January 5, 2014 February 28, 2019 Categories General TopicsLeave a comment on New Kura! Review of US sake production. A little while back I realized that I have no idea what the relative size of the US Sake brewers are. How do they compare with the Japanese brewers? While I regularly see production information on particular Japanese brewers I have not seen it for non-Japanese brewers. Given this I started looking around to see what I could find. I searched around but found nothing. I sent notes to each of the breweries outside of Japan and waited to see if they would reply; three of them did reply but only one of them shared their production level: Masa Shiroki, owner of Artisan Sake Maker of Vancouver BC. I check distribution channels and was pointed to SakeOne. Steve Vuylsteke, SakeOne’s president was very gracious and shared some of his time with me. They do their best to track the industry but the data he shared are only estimates. However, this is exactly the data I was looking for when I began my search. I was just trying to understand the relative size of the US breweries. I have only visited my local Kura, SakeOne, so I had not been able to get a sense for the size differences. What you don’t see in this chart are the smaller non-Japanese brewers. For North America this includes: Moto-i, Texas Sake both in the US, Artisan Sake Maker and Nipro both in the Vancouver BC area, with Spring Water Sake of Toronto rounding out the Canadians and finally Nogne0 of Norway and Go-Shu of Australia. I find this very interesting. My local reference point, SakeOne, while not tiny is the smallest of the US Kura that have been around for a while (more than 5 years). 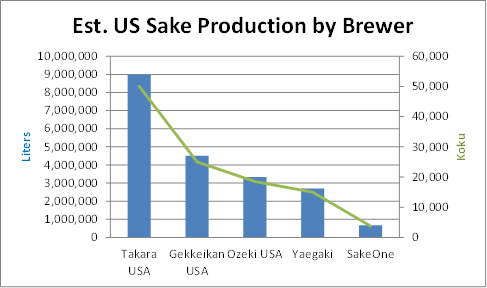 The next largest, Yaegaki has about 4 times the production levels of SakeOne, Ozeki has almost 5 times as much, Gekkeikan USA almost 7 times as much and Takara more than 13 times as much as SakeOne. The only other non-Japanese brewer I have data for is the Artisan Sake Maker which comes on the board at just over 1% of SakeOne’s production level with 9,000 liters. Yoed Anis, the owner and Toji of Texas Sake, while not wanting to give their production numbers guest that they might be around the same size or a little larger than Spring Water. Together the US Kura produce about 20 million liters of sake. Compare that to the amount of wine produced in the US, about 2,500 million liters; that’s less than 1%. But how does this compare with Japanese kura and production? Well, the two largest Japanese sake producers are Hakutsuru and Gekkeikan. As you can see from this chart, the top two producing Japanese kura produce quite a bit more than their American counter parts. They each come in at more than 7 times the size of the largest American kura, Takara. As compare to my reference point, SakeOne, Hakutsuru produces a little more than 100 times as much while Gekkeikan is just a little bit less than 100 times as much. However, while these guys are big they give a distorted image of the average size of a Japanese kura. 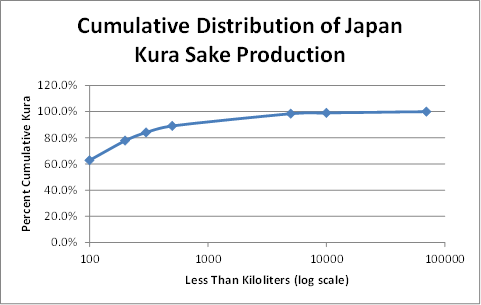 John Gauntner provided me with all the data on the Japanese kura including a distribution of kura to production levels. As we can see from the chart below, more than 60% of all Japanese kura produce less than 100,000 liters of sake. 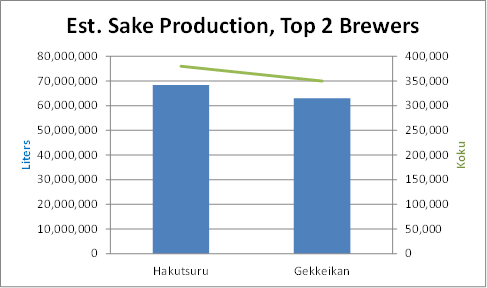 So, from this we also see that SakeOne has a higher production level than 90% of all Japanese kura. Said another way, SakeOne would rank in the top 10% of sake producers worldwide. Takara USA ranks in the top 1% worldwide. Sake production from all US kura is about 20,000 kiloliters. We supplement that with around 7,000 kiloliters of import sake. These imports represent only 0.6% of Japan’s sake production. About 3,600 kiloliters consumed in the US, 13.3%, both domestic and import, is premium sake. What fraction of import sake is premium sake? What fraction of US produced sake is premium? For me, these are still open questions. Have a wonderful Nihonshu no hi (Sake Day) October 1! Author WillPosted on September 29, 2012 September 29, 2012 Categories General TopicsTags Sake Production, US Sake Production, US Sake Statistics5 Comments on How Big Are They? Nice huh. The sake in the bottle looks completely clear but when pored into a glass it shows its pinkish purple color. 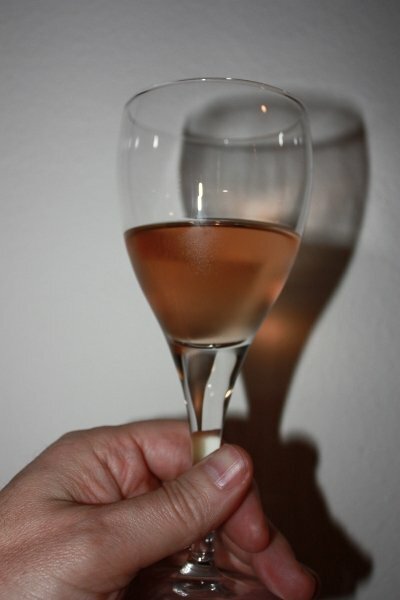 Sweet heavy aroma, like fermented black rice maybe a little like a rose, but is light and uncomplicated on the palate. The initial draw of sake into the mouth carries the full force of the aroma with a flavor that matches. Round and full bodied as it enters the mouth but almost completely disappears as you swallow, leaving vary little, if any, after taste. This is a very drinkable sake. 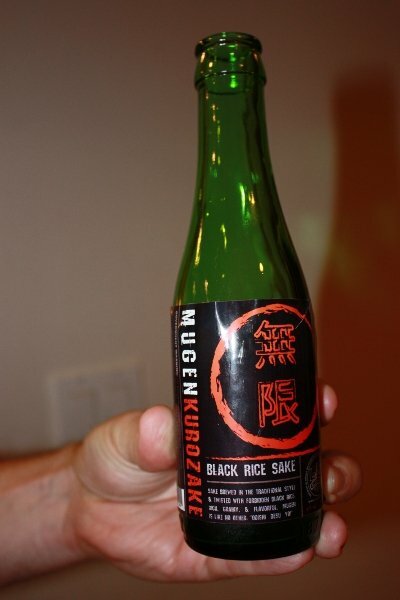 Kip documents is brewing of this sake in two posts, part 1 and part 2, at bierkast.com. Having grown up in the Portland area I witnessed a huge transformation in the local wine industry as Oregon began to establish itself as a premier Pinot growing region and wine producer. Closely following on the heels of this revolution was changes in the beer seen. While Oregon had homebrewers as witnessed by a local writer, Fred Eckhardt, publishing in 1969 his book “A Treatise on Lager Beers,” it wasn’t until 1979 that Oregon made homebrewing legal. Well practiced homebrewers were brewing their own versions of German and British beers and began going commercial in a big way with the Widmer Brothers (Widmer Brothers Brewing) and the Ponzis (Bridgeport Brewing) both in ’84 and the McMenamins brothers brewpubs in ’85. These changes were not alone, Jack McAuliffe had started the New Albion in California in ’76 and Anchor Brewing of San Francisco had begun their own revolution under the leadership of Fritz Maytag beginning in ‘65. Shortly after Jack started New Albion, Ken Grossman, a homebrewer that had started a homebrew supply store in ’76, saw both Jack and Fritz’s operations and decided to follow suit with Sierra Navada in ’79. Across the country, Jim Koch opened Samuel Adams and began brewing in ’84. These early movers inspired many many more who followed in their footsteps. Many if not most of those who followed first caught the brewing through homebrewing. Homebrewers who did not, themselves, go commercial became huge supporters of the new small craft brewers. Now, some 30 years after those early beginnings, craft beer is a given. There is not a grocery store or restaurant here in Portland that does not carry an array, if not a vast array of craft beer. So, why am I going on and on about beer in this, a Sake brewing blog? Because I see no reason why sake can’t go the way of craft beer and explode with popularity. The more we brew sake, the more we learn about how to make really great sake and the more we share what we learn the more will follow igniting the fire that will burn like the sun. Update 5-10-12: I just wanted to add the first two brew pubs in the US were Bert Grant’s in Yakima, Washington in 1982 which was followed a few weeks later by Bill Owens with Buffalo Bill’s Brew Pub in Hayward, California in 1983. I finally did it! My book, Brewing Sake, is out. Brewing Sake hit Amazon around the 20th and is making it into the channels. It can take up to 6 weeks to fully make its way through the channel. I am told that at least one person has been able to order it in Denmark through a standard retailer, so it is working its way into the channel nicely; a bit quicker than I had expected. Brewing Sake: Release the Toji Within is here on Amazon and interestingly enough, the used copies are asking 2.5 times the price of the new copies. J Are there really any used copies? I wouldn’t think so. I believe that I have pulled together a lot of material that is pretty hard to come by for those of us who don’t speak, and more importantly don’t read, Japanese. The table of content is below. The overall layout is a quick introduction on sake brewing and the equipment needed as well as a step by step walk through to begin with. This is followed by details on each of the ingredients and chief measurable characteristics. Next, is a bit about how to protect the sake. Then I dive head long into each step of the process. After this we look into the details of analyzing your sake for each of its measurable characteristics. This is followed by a brief look at sake’s enemy, Hiochi-kin. I have then provided a significant glossary containing more than 170 entries. Finally, I give a list of links to places where you can find specific pieces of equipment. If you get a copy I hope you will also write a review on the Amazon page on what you think about the book. 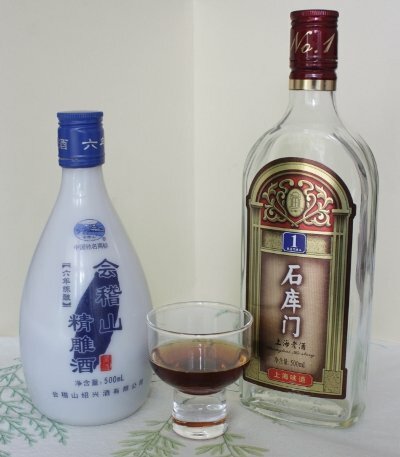 Author WillPosted on April 1, 2012 April 1, 2012 Categories General TopicsTags Brewing Sake, Brewing Sake Book, New Sake Brewing book6 Comments on I finally did it! My book, Brewing Sake, is out.